An excerpt from The Three Stages of a Physician’s Career: Navigating from Training to Beyond Retirement. The practical aspects of making a medical career transition can be divided into three phases or stages: waking up, taking stock, and taking the leap of faith. Note that this process is the same whether the physician is anticipating a transition out of full-time practice, planning a transition to a new full-time or part-time non-medical career, or simply anticipating a transition to retirement. There may come a time when you realize you are unhappy enough to want or need a career change. That’s the time to do a brutally honest assessment of what has worked in the job and career and what has not; what is fun and what you hate. Then, determine what is reasonably under your control. Expect to experience some powerful emotions in this first stage. Early in the transition you may feel out of synch and strangely detached or lost. You will begin to question your entire professional role as a physician. You also may feel energized to be turning over a new leaf, leaving a frustrating position, or starting something new. You may feel sad about leaving old friends and comfortable ways. All of these emotions may be confusing for someone who has always been centered and self-confident. Allow yourself to feel these feelings, recognize and name them. Talk about them with trusted friends and allies, coaches, mentors, therapists, and spouses/partners. Write about them in your journal. Pray and meditate about them in private. It is also important to acknowledge and celebrate what has worked. Plan a formal celebration to remember the good things and the people who have helped make this job and your career a success. Endeavor to leave former jobs and colleagues with a positive memory. Do your best not to burn bridges. 1. What financial resources do I have available to assist me in transition? Are they enough? Will these resources support a 3–6 month leave without pay? 2. If my financial resources aren’t adequate for an extended time without pay, how much time can I comfortably take to work through my transition while still working? Do I need to work full time or can I reduce my clinical work to part time? 3. What professional resources (e.g., career coach, therapist, mentor, accountant, financial planner, insurance agent) am I willing and able to make use of? 4. What non-professional sources of support can I make use of (e.g., spouse, family members, mentors, friends)? 5. Given my age, how many more years do I need to continue to work? How many more years do I want to work regardless of income? 6. Do I have the support of my key loved ones? If not, how can I best go about getting that support? 7. What is my calling in life? Am I following it? 8. What is really important to me: what are my specific values and what is my purpose? 9. What am I passionate about? What are my marketable skills? 10. What aspects of work bring me joy and satisfaction, and what aspects of my work do I dislike and wish to give up? 11. What activities consistently yield personal meaning for me, in or out of the workplace? 12. How will I continue to find personal meaning, a sense of personal contribution, and personal connection to others once I retire from the practice of medicine? 13. What legacy do I wish to leave in this world? Answers require time alone to think and to reflect. Rushing this phase of transition usually leads to a poor career decision—one that is not consonant with your inner self. The third stage of transition is the actual process of activating a plan for a mini-transition or a full-life transition created in Stage 2. In this third phase, specific steps propel you toward the future you envision for yourself. Action steps should be “SMART”: Specific, Measurable, Achievable, Relevant, and Time-specific. You can anticipate Stage 3 to be stressful. Therefore, first and foremost, ensure a sensible self-care plan is in place. Ideally, that plan includes regular aerobic exercise at least 30 minutes three days a week, at least 50 hours of sleep a week, a healthy diet, a program of regular spirituality, and time for friends and fun. Now is the time to implement values-based time management and values-based money management strategies with professional support as needed. Above all else, transition is a spiritual path that requires a leap of faith, trust in yourself, and willingness to act despite your fear and inability to predict the outcome. 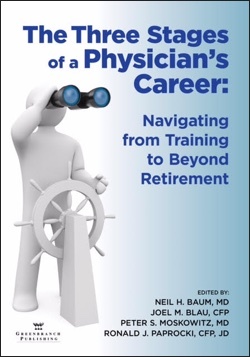 Neil Baum, Joel M. Blau, Peter Moskowitz, and Ron Paprocki are the authors of The Three Stages of a Physician’s Career: Navigating from Training to Beyond Retirement. Where is the research to inform policy on gun violence? How do I fix communication with my patients?